“I see our hotel as a Mountain Hotel by the Sea”, says Gianfranco Roggeri – three-star Hotel Lucciola’s owner – as he introduces his hotel. A Mountain Hotel by the Sea is something rare to encounter and, definitely, Hotel Lucciola has the rare and unique ability to offer a mountain-and-coast feel to its visitors. The hotel is perfectly located on the westernmost Ligurian coast, by the Marina degli Aregai tourist harbor in Santo Stefano al Mare, right in front of the Ligurian sea, offering amazing open views of the coast of this picturesque part of Liguria. Being right by the Ligurian Sea offers many advantages all year round. Beside admiring one of the most astonishing views from one’s bedroom and breathing the fresh sea breeze while waking up in the morning, or relaxing in the flourishing Mediterranean garden overlooking the harbor, from May to September guests can take advantage of the private beach discount offered by the Hotel. Guests can access two nearby private beaches at a discount and, when they stay a few days, entrance, beach umbrella and chair are free. The Ligurian coast is famous for its mild climate all year. Spring offers gorgeous fresh and bright days, Summer here starts in May and lasts often until October, and it is very common to enjoy sunny warm days in January or February. Hotel Lucciola is, in fact, open 365 days a year as the weather and the beauty of this coast attract visitors all year round; “Winter is the best time to visit this corner of Liguria”, says Mr. Roggeri, “in winter the coast is more authentic and relaxing and still offers the opportunity for many activities and interests”. For example, for those who love diving or rowing they can practice in winter as well since the hotel is a point of reference in organizing diving trips or kayak/canoe rentals all year. Hotel Lucciola’s location is also strategic in that it is right by one of the most beautiful greenways in Europe, the Riviera’s coastal greenway, a bike track running on the old railway line linking Ospedaletti to San Lorenzo along the coast. 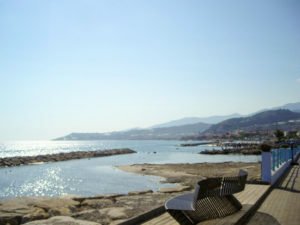 The 24-km (14.9 mi) track – one of the longest in the Mediterranean Sea – has benches, bicycle’s parking lots, restaurants, hotels, cafes, and drinking fountains and it connects 8 municipalities. 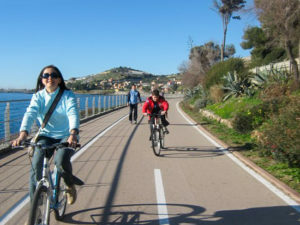 Hotel Lucciola’s guests can start biking on the Riviera’s coastal greenway right from the hotel, with the free bikes provided, and continue westward; it is the perfect way to spend a day along the coast while visiting historical towns, tasting local food and appreciate the many colors, fragrances, and nuances of this spectacular coastline. Additionally, the 2015 Giro d’Italia, the 98th running and one of cycling’s Grand Tour races, will start in San Lorenzo al Mare, on May 9th, with a 17.6 km (10.9 mi) team time trial and will conclude in Milan, on June 1st. For the first time, one segment of this important race, the fifteenth race of the 2015 UCI World Tour, will run in the Ligurian greenway. Hotel Lucciola’s guests will have the unique opportunity to enjoy a first class view of the race from the hotel’s terrace which overlooks the greenway. A Mountain Hotel by the Sea is well inserted in and is deeply connected to the region it belongs to, since the mountains, and the inland leading up to them, can be reached within short distance. From Hotel Lucciola, one can get to mountains 1500 mt high within less than one hour and historical inland villages like Triora or Realdo in 30 minutes. Being between the beautiful coast and grand mountain peaks is the peculiarity of this area; due to a lifelong passion and extensive personal experience of his region, hotel’s owner knows this unique aspect and has not only completely embraced it but is eager to share it with the hotel’s guests. Mr. Roggeri is a pioneer in appreciating and showing interest in this region as a whole, he understands very well that the richness of this area of westernmost Liguria doesn’t reside in the coast only, but in the mountains as well and everything in between. The connection with the mountains and the inland is evident when entering the hotel: the pictures in the dining room and in each bedroom show both images of the coast and the mountains; the staff is very prepared about hiking and mountain biking itineraries, provides detailed maps, and can be of assistance in the organization of hiking trips and biking tours. Guests can discover hiking trails such as those starting in the picturesque mountain villages of Realdo and Verdeggia leading to Mt. Fronté (mt 2152), Mt. Saccarello (mt 2200), Tenarda Lake (mt 1330) or Melosa Pass (mt 1540). 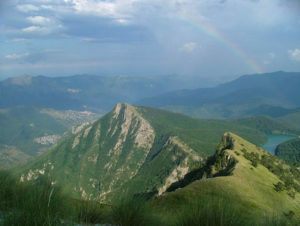 In addition, while hiking in this area, guests can find out more about the Brigasca culture original to the high Argentina Valley and taste delicious “cucina bianca” dishes, a traditional cuisine developed in the Ligurian and Maritime Alps made of local products of pastoral civilization. The mountain villages of Verdeggia and Realdo are still a perfect example of such culture. Guests can also discover Triora, the historical village of witches, which is definitely worth a visit for its peculiar history and much more. There are also many biking trails the hotel staff can recommend when visiting. Beside the beautiful greenway, guests can ride free bikes provided by the hotel on inland trails such as those reaching the villages of Cipressa and Pietrabruna, or mountain trails like the Mt. Faudo (mt 1149), Via Marenca (an ancient shepherds’ path) and Via del Sale (old Salt Route) trails. The hotel staff can arrange transportation to various destinations as well as hiking or biking guides. The hotel promotes and participates in many events that are symbol of the local life and carry forward ancient traditions. At the end of February the city of Taggia hosts its historical parade, and in July the most ancient celebration dedicated to “St. Mary Magdalene of the Forests”, which perhaps hides a pagan origin, heritage of the Roman settlers, or relates to the sacred rites of the ancient Ligurians, dedicated to the fertility of nature and earth; the scent of lavender is the central symbol of this celebration. In May, the procession of the Mary of Mercy barefoot bearers takes place in the village of Triora and in August, Mt. Saccarello peak is the site of the Redentore festival with a procession that starts just above the village of Triora. Savoring mouthwatering local dishes at Hotel Lucciola’s restaurant is just one more of the many special treats for guests. The cuisine is mainly focused on traditional fish recipes: baked fish Ligurian style, fish ravioli, and fish baked in salt crust are just a few examples of the flavorful menu available. Cooks at the restaurant only use the best quality local ingredients; all olive products are of the prestigious Taggiasca quality – characteristic of this region – and come from the nearby Valle Argentina Consortium. In fact, the hotel believes so much in high quality olive oil and olive products that it even has its own small olive oil production and organizes visits for guests to oil mills in the area. The wine is also carefully chosen; the restaurant proposes local wines such as Rossese, Vermentino, and Pigato from the excellent nearby Gajaudo winery, close to Dolceacqua. The buffet breakfast is very rich offering a wide range of breakfast choices, and delicacies such as homemade cakes and canestrelli, a traditional biscuit of the Piedmont and Liguria region.